All rooms are extremely spacious and are comfortably and tastefully furnished to high standards. Each accommodation has its own separate modern kitchen, which is equipped with electrical appliances, crockery, cutlery and utensils. Each apartment boasts an incredible view of the sea and garden. For large groups, i.e. 10 persons or more, it is possible to connect the Ocean View and Plum Tree Apartments. This is perfect for Family Reunions, bridal parties, training functions and retreats. Lush vegetation – in fact more green than you have ever seen! Near deserted beaches and much more!! 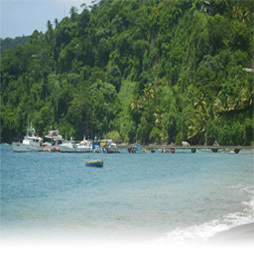 Not far from Concord Water Falls and the fishing village of Gouyave, Mango Palma is situated within the residential area of Mt Nesbit and is within walking distance of Palmiste Beach. Named after the majestic mango tree which sits within the garden, which has been famous over many generations, Mango Palma offers an authentic Caribbean experience, peace, comfort and a perfect base from which you can explore the entire Island.